Confidence is a major factor in football, and I think it’s pretty clear that, for a variety of reasons, the confidence has been sucked out of the Hearts players. The result against Hibs and the subsequent fallout has clearly had an effect on morale around the club. 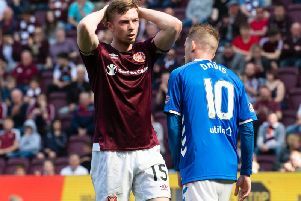 The anger since that game stems not only from what happened at Easter Road two weeks ago, but also from the fact that there was no sign that lessons had been learned from the defeat at the same venue a year previously. Defeats against your bitter rivals always hurt, but when you go out of the Scottish Cup against them two years running, in the limp manner we did, the backlash from those who love the club is always going to be that bit more intense. The fact the team hasn’t responded positively in the subsequent league fixtures has merely exacerbated the situation. It’s all well and good talking about how you’re going to turn things around – and I did plenty times myself as a player during difficult times – but eventually any positive talk has to be backed up by an upturn on the pitch. I’ve heard it claimed that the performance against Ross County was an improvement, but it was nowhere near good enough for Hearts. I know this might be deemed a silly observation – and plenty will feel it’s nitpicking and of no relevance – but I couldn’t help but notice that the majority of our players were wearing gloves on Wednesday while not one of the Ross County players were. I recognise that football has changed since my era, but I still think if I was up against a player wearing gloves, it would make me fancy my chances of winning my individual battle with them. I definitely wouldn’t have fancied going into a match with a bunch of team-mates predominantly wearing gloves. I felt that scenario offered a good snapshot of our team at present. The way things have gone for us recently is not a major surprise considering the amount of risk involved in what we’ve done as a club over the last few months. When you have the level of turnover in personnel we have, both in the dugout and on the pitch, especially when so many of those are coming into a new environment and not used to the style of football, then there is always a chance of difficulty arising. What we need to remember, however, is that a lot of these changes were our choice as a football club. They weren’t all forced upon us. Unless we were confident that the transition wouldn’t have a detrimental impact on our season, then we shouldn’t have been so quick to change everything. Even allowing for our difficulties, I still think we’ll finish in the top six. It’s imperative that we do because there will be another outcry if we slip into the bottom six. In terms of our league position, we’ve been fortunate so far that St Johnstone haven’t capitalised on our slump. With second place and the Scottish Cup now beyond us, the aim for the remainder of the season has to be maintaining a respectable league position and ensuring that we develop the nucleus of a team to go forward into next season. I know a lot of the players are on short-term deals but we need to keep some form of continuity because we can’t afford to have yet another summer overhaul and another transitional period at the start of next season. We’ve found to our cost that cobbling a new team together and throwing them into big matches is not conducive to success and allowing the new players to flourish. Stability and continuity at a football club shouldn’t be undervalued. Yes, it’s always nice to have a bit of freshness and bring in new faces, but this has to be managed sensibly so that the team retains a core and identity. When everyone’s fit, I think Hearts’ squad is of a pretty good calibre by Scottish standards. We have plenty talented players of decent pedigree. But there is no doubt that we need to establish some genuine leadership because right now it doesn’t feel like we have that. We’ve changed captain from Alim Ozturk to Perry Kitchen during the season and now Perry is in and out of the team and the captaincy seems to be getting shared around. We need an identity, a personality and a spirit as a team, and at this moment I don’t see it. People say the modern game has totally changed, and in many ways it has, but in Scotland, players do still stay at clubs for a lengthy period of time. Look at Scott Brown at Celtic, Murray Davidson and Steven Anderson at St Johnstone, Andrew Considine at Aberdeen, Lee Wallace at Rangers, Paul Hanlon and Lewis Stevenson at Hibs. There is no doubt that players like this, who know their clubs, are really important. Apart from our younger players, we don’t really have any long-term servants who can help hold things together in difficult times and make sure their team-mates are well aware of what is expected when they pull on the jersey. Supporters appreciate players they feel they can relate to and have a familiarity with, even if it is sometimes a love-hate relationship. They don’t want their team completely changing every season.